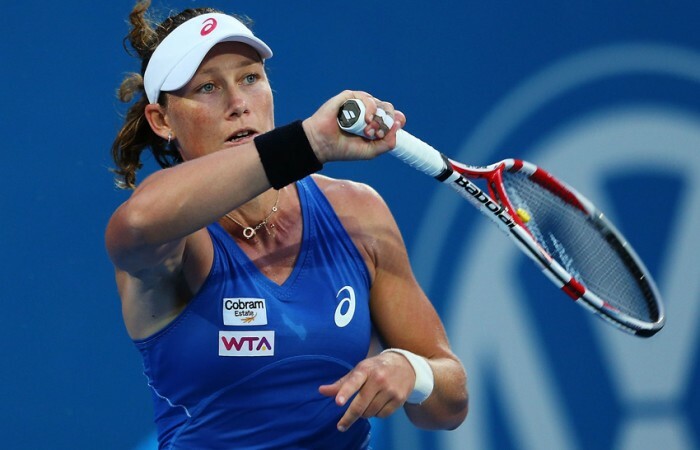 Sam Stosur is remaining upbeat about her Australian Open hopes despite her sorry run continuing with a rollercoaster first-round exit from the Apia International. Sam Stosur is remaining upbeat about her Australian Open hopes despite her sorry run continuing with a rollercoaster first-round exit from the Sydney International. Stosur’s 6-3 6-7(7) 6-4 defeat at the hands of China’s world No.42 Jie Zheng was her fifth consecutive loss in Australia, a miserable run that stretches back to last summer. The world No.9 will head to Melbourne for the Open starting next Monday alarmingly underdone after playing just two matches since undergoing minor ankle surgery six weeks ago. With little history of performing well at a tennis major without a strong build-up, Stosur’s Australian Open prospects look grim. 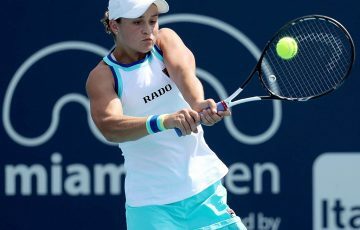 But the 2011 US Open champion insists she will take a considerably more positive mindset into the season-opening major than last year when she crashed to a first-round loss to Romanian Sorana Cirstea. Stosur refused to blame her surgery as any kind of excuse for Monday night’s loss and said she actually felt like she’d made significant strides since last week’s rusty straight sets defeat in Brisbane to Swede Sofia Arvidsson. “It’s bad because it’s another loss, but to be honest I feel a lot better after this loss than last week’s loss because I felt like I did some better things,” Stosur said. “It’s not like I was playing a bad opponent either – either week. “I feel like I at least got out of a point in the match where I felt I could have been playing better and actually got through that and at least got myself into a winning position. “I think another week I’ll be playing better again. You never know what can happen with one win. Stosur made a bright enough start against Jie, establishing two break points in the first game. But after failing to convert either, Jie broke Stosur in the second and sixth games of the opening sets as Australia’s big hope struggled to find her rhythm. Stosur clawed her way back from 5-1 to 5-3 before netting one of several mistimed backhands to hand the former Australian Open and Wimbledon semi-finalist the opening set. The sixth seed mounted a revival in the second set, gamely saving a match point in the tiebreaker before blowing a 3-1 advantage in the decider. Her elimination leaves Stosur with just two wins in seven years in Sydney since falling to fellow Australian Alicia Molik in the 2005 title match. 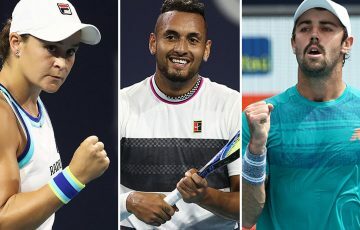 The latest loss also ended Australian interests in the women’s singles after Casey Dellacqua made a swift first-round exit earlier on Monday. Dellacqua lost 6-4 6-1 to 42-year-old Japanese qualifier Kimiko Date-Krumm, the world No.112 and oldest singles player on the WTA Tour. Former Sydney champion Li Na, meanwhile, advanced to second round with a tough straight-sets win over American Christina McHale. The Chinese fourth seed won 7-6 (7-2) 7-5 in a marathon two-hour affair to set up a meeting with Japanese qualifier Ayumi Morita, who ousted Slovakian Daniela Hantuchova 1-6 6-3 6-3. Stosur’s French Open conqueror Sara Errani is also through to the second round after thumping Czech qualifier Karolina Pliskova 6-1 6-3. The little Italian third seed next faces Russian Maria Kirilenko, a 7-5 6-2 first-round winner over Australian wildcard Olivia Rogowska. One-time world No.1 Jelena Jankovic removed Austrian Tamira Paszek 6-2 7-6 (7-5) and will play unseeded Italian Roberta Vinci for a quarter-final berth. Vinci upset Russian Nadia Petrova 7-5 7-5.